Pranksters including Procter & Gamble, Google, and even the White House joined in on the April Fool’s Day fun. NBC’s Kevin Tibbles reports. >>> finally tonight, a lot of people woke up today to a new story out of france -- a sure sign of the times . it was announcing the residents of one french town would soon receive their morning newspaper by drone. the day went on from there. on the first of april though many of us try to be on guard, people are still going to try. they will see the shot and take it. a few of them are going to get through, as nbc's kevin tibbles reports for us tonight. >> reporter: mr. speaker, the president of the united states . >> he looks like you were expecting somebody else. >> reporter: yes. even the highest office in the land got into the act on a day when the pranksters come out to play. when everyone from corporations to the kid down the block tries their hand atom foolery. >> >> companies know if they do something outlandish it will be talked about. >> april fools on all of y'all. 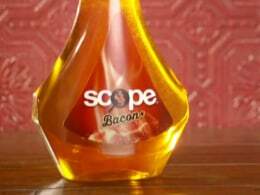 >> reporter: a makers of scope pulled a porker with bacon mouthwash. >> for breath that sizzles. >> reporter: a car that can also coif -- the honda hair. >> no hair is too tough for honda hair. isn't that nice? >> reporter: want to tweet on april fools ? twitter says you have to buy a vowel. five bucks a month for a, e, i, o, u. joan rivers tweets back, why buy vowels when you get y for free? suckers. illinois banned tweeting all together urging folks to get outdoors where only the birds tweet. mother nature 's april fools joke at the ballpark. last year, 21 days over 60 degrees. this year, zero. >> reporter: how about smell searching by google nose where you can search by scent because smelling is believing. >> what does a ghost smell like? >> reporter: g mail blue, where everything is -- well. >> the little lines are in blue. when you go into help it's blue. >> it's gmail, only bluer. >> reporter: and boden rolled out the man skirt but when you click to pick your size, this pops up. meanwhile, back at the white house . >> i think i'm stuck. >> reporter: kevin tibbles, nbc news, chicago.